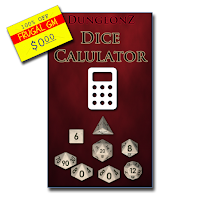 This week's Free GM Resource is an Android dice roller called Dice Calculator by DungeonZ. While I am highlighting the Android version I've downloaded, there are also Windows and iOS versions available. 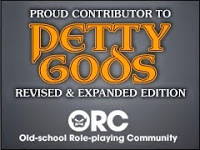 The programmer put links to all the versions on his blog (this post specifically). When I first took a look at this program I was quite disappointed. It really didn't look all that functional or altogether user-friendly. After a but of poking and prodding I realized the program is pretty minimalistic, and I think my expectations were for a bunch of extra "overhead". There are three pages to the program, which you can reorder. The main page looks like a calculator, but with some extra letter buttons. Another page is there for you to save custom dice functions and the last page has a history of your rolls. Odds are you'll need some help figuring out the notation, but there is a little blue button with the "information" symbol on it. One click and I had everything I needed to know. There is some sort of "lobby" feature on the history page I haven't figured out yet.....but to be fair I haven't even tried. If you want/need a simple die roller that comes in a variety of flavors for your different devices, I'd give Dice Calculator a go. Just having one program for most of your devices in and of itself might be the reason for using this.